The Brick Castle: Rubiks Spark - bringing the cube into the 21st century. Rubiks Spark - bringing the cube into the 21st century. We've all played with a Rubik's Cube. They were first introduced in 1974 and have remained incredibly popular and possibly frustrating ever since. 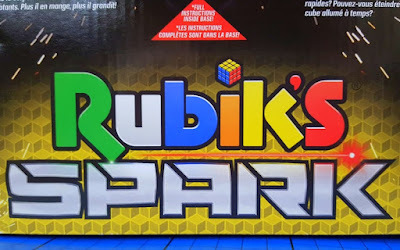 Brand new for this Autumn is the Rubik's Spark, an electronic version with 6 different games to play, either alone or competitively against someone else. The first thing you spot is that this cube doesn't move or twist in sections, you turn the whole thing to control where the flashing light travels. It's very different and takes a bit of getting used to at first. 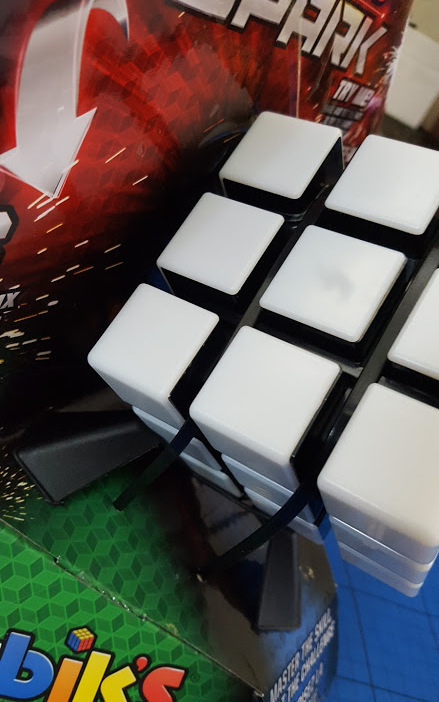 You start the games by tilting the cube - and it's noisy - so expect it to go off if you move it unless you are very careful - it arrives cable tied to it's packaging and is set to a 'Try Me' demo mode. Something to remember if Santa will be carrying wrapped presents around the house on Christmas eve night! Once you get comfortable with turning the whole cube, the games are pretty intuitive. Nice and varied, and you can get somewhere with each of them from the first play. Each game is accessed by settling the light onto it's image square on the cube. 1. Tilt 'N' Zap - 'catch' the lit up square as it goes past the 'Lightening Bolt' symbol. It gets quicker and changes route, and I'm absolutely rubbish at this! It's harder than it sounds because the light goes one way and you may have to tilt in the opposite, which feels weird. 2. Follow The Path - as it suggests the light travels around the cube creating a path, and you have to follow, repeating the pattern. The way you change the lit up square is by tilting and I find with this game it's a bit clunky. You have to stay pretty upright with the cube, and it's a little slow to respond, so I often accidentally repeat moves and go too far. My partner is great at it! 3. Seek And Destroy - I'm really good at this, my best score is level 9 already (well, okay, I'm mediocre for a beginner)! Targets appear on the cube, and you lead the light around capturing them all within a time limit. More targets and shorter timer each level makes it gradually harder. 4. Light The Cube - in this game your aim is to light up the entire cube by following the target with your light, but not accidentally wiping out any lit cubes. I struggle with this one, mainly through my own impatience. 5. Snackin' Snake - travel around the cube 'eating' the lit cubes and gathering a longer and longer tail. Everyone knows and loves this game, although it's not usually in 3D! The time limit is what catches me out, rather than eating my own tail. 6. 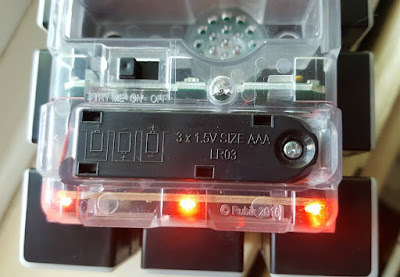 Rubik's DJ - it plays a tune! Tilt and turn to select different notes - and pretend you are playing a game and are brilliant at it. Fools everyone! 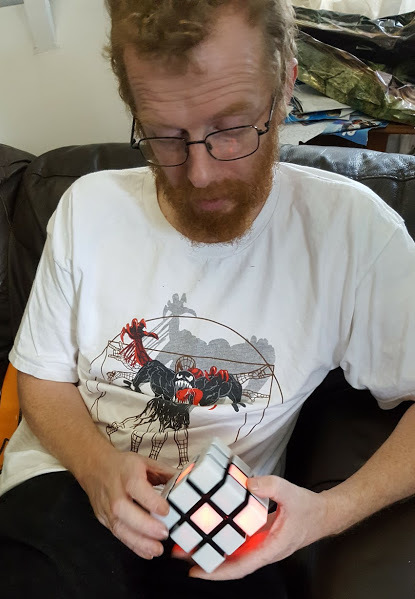 The Rubik's Spark is as not quite addictive as the original cube, but it's not bad and some of the games really can lose you half an hour very easily. Each game has 25 levels, and can be played solo or 2-player taking turns, so there is a lot of gameplay for your money. Good for anyone who likes logic puzzles, and a bit more active than a joystick without requiring you to leave the sofa, I think Rubik's Spark will be on a lot of wishlists this Christmas, and will please a lot of people - although the music can become a bit much for non-players to have to listen to. 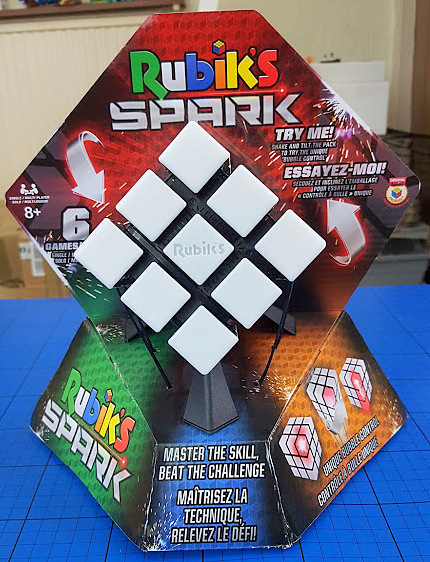 The Rubik's Spark is available to buy now rrp £24.99, instore and online, and recommended for age 8+ - which is about right, although determined youngsters might be able to master it before then. 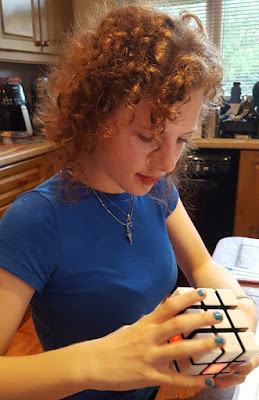 Rubik's actually sell a range of products, including the Original Rubik's Cube in various sizes, Touch Cubes for people with a visual impairment, Blank and Personalised Cubes, the Rubik's Snake and loads more. Find out more on the Rubik's Website. We were sent our Rubik's Spark for review.